TimLybarger.com: Unplayable movies and other treasures. I don't own a video disc player and I don't plan on buying one; but when I happen across a box of 20+ video discs on sale for 15 bucks and the one on top is the greatest movie of all time, it's time to make a deal. 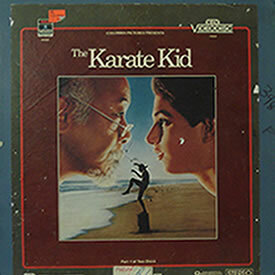 If I have no use for one of the discs, I definitely don't have any use for all of them...so after a bit of bargaining and deciding to push the Teen Wolf disc to the side, I walked away with The Karate Kid on video disc format for a very minimal price. My wife wonders why I bought it considering it'll never get played (not to mention the fact that I have two different copies of the same movie on DVD already)...but some of you reading will understand. It's a matter of history. A matter of nostalgia and collecting. 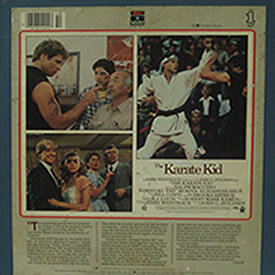 A copy of my favorite movie on a format I'll never use for less than I would pay for a fast food burger? I'll take it. Tomorrow is this month's flea market and I'll be taking my 2-year-old daughter along for the fun. She's as excited as daddy at the thought of the treasures we'll find.